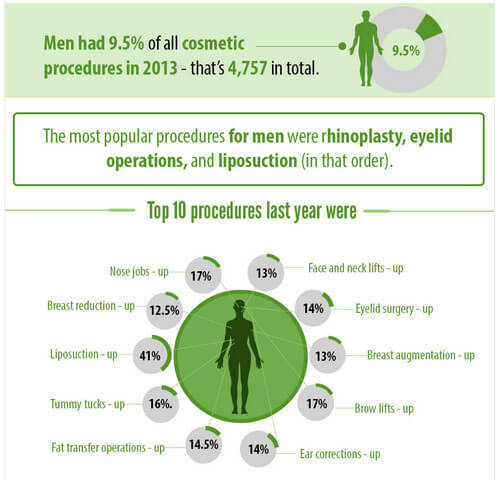 Male demand for Cosmetic Surgery has been rapidly increasing over the years. Not only do men want to look younger and more attractive, they also want to eradicate signs of aging, such as deep wrinkles around the eyes and on the forehead, to appear more capable and competitive at work. With a desire to obtain healthier looking skin, men would undergo Laser Thread Vein Removal treatments to remove visible blood vessels on the cheeks or nose, and Oxygenising Facial Peels to treat acne scars to achieve a ‘clean’ face. Reason being that many of them do not want their social life to be visible on their skin when at work; they wish to look ready and accessible. Did you know the rush of male patients has increased radically, and become somewhat of a new trend? In the 1980s, men accounted for just 5% of the patient cohort, but have now grown to represent 20%. Laser Hair Removal is a long lasting solution for hair removal, and is growing in popularity against other common methods, such as waxing or shaving. Nowadays, men are just as likely to have issues with unwanted body hair as women. The demand for Laser Hair Removal carried out on men focuses more on shaping the beard, and thinning excessive hair growth on the back, chest area, and legs. It’s not just women that see the signs of aging in their faces and don’t like it. Men, while they might not be as open about it. Botox and Dermal Fillers are gaining more popularity amongst men, due to concerns about signs of tiredness, facial lines and wrinkles. Fillers contain hyaluronic acid to improve dark circles under the eyes. They can be used to add volume to the cheekbones, frame the face, and heighten the bone structure – we relate these characteristics with youth. Men prefer this one-shot anti-aging treatment in comparison to surgical methods as it requires little downtime and maintenance. This condition has a negative impact on public image and is often associated with alcoholism. Everyone wants perfectly clear skin, men that suffer from Rosacea and Acne have decreased self-esteem, and will undergo a combination of treatments in order to improve the condition of their skin so they appear (and feel) more attractive. The number of Hair Transplants performed on middle-aged men is on the rise due to Male Pattern Baldness – a common characteristic in the effects of aging in men. Receding hairlines, thinning hair or even baldness can make you appear a lot older than you actually are, and greatly affect ones self-confidence when at work or in public. At Aesthetics of Essex we are offering a range of services and treatments exclusively for men. Male treatments can range from Facials and Massages through to Line and Wrinkle treatments to remove eye-bags. We also offer surgical procedures, such as Hair Transplants and Gynaecomastia, performed by our qualified specialist surgeons Dr Mario Russo and Dr Navid Jallali. We understand that wanting to look good doesn’t mean that you want to give up your masculinity. Our treatments and products will help you feel good and look good. We hope you have the confidence to gain the look you require. Contact us today to make a booking.